Writer/director Alex Garland finally made a name for himself with one of 2015’s best films in Ex Machina. Whenever this happens, there’s bound to be plenty of scrutiny no matter their next project. Deciding to adapt Annihilation, a possibly unfilmable novel that’s the first part of a trilogy — Jeff VanderMeer’s Southern Reach series — proves Garland is more than up for continuing to take on hard sci-fi. Paramount’s decision to release the film overseas via Netflix shows even they had no idea how to truly market it. Filled with more questions than answers — and one of the most terrifying scenes ever filmed — Annihilation may not be here to break box office records, but it sure makes you think long and hard after it’s over. Lena (Natalie Portman) is a biologist, trying to cope with the absence of her missing husband, Kane (Oscar Isaac). When Kane randomly shows up after a year — and acting super weird — she wants answers. But before she can have them, Kane has a seizure. En route to the hospital they are taken to the Southern Reach compound. Here, Lena meets Dr. Ventress (Jennifer Jason Leigh) who explains to her that “Area X” aka “The Shimmer,” is expanding after an object from space collided with a lighthouse in a national park. Kane is the only person who has managed to come back after going in to investigate. Now, Ventress and Lena are headed in — along with physicist Josie (Tessa Thompson), anthropologist Cass (Tuva Novotny), and paramedic Anya (Gina Rodriguez) — to see if they can find the answers the military couldn’t. And that’s all you should know. No review outside of a full thesis would be able to cover what’s going on in Annihilation. And multiple viewings are definitely required. This is one of those sci-fi epics that will long be dissected and analyzed for years to come. Even if most people might not see it. With that being the case, at least I can say that Garland has put together a film that’s so intense — even though a little too slow at times — and hypnotic that you’re glued to the screen. The cast is fantastic with Garland leading a female lead cast into what used to be men-only territory. Just another layer of his cinematic onion. 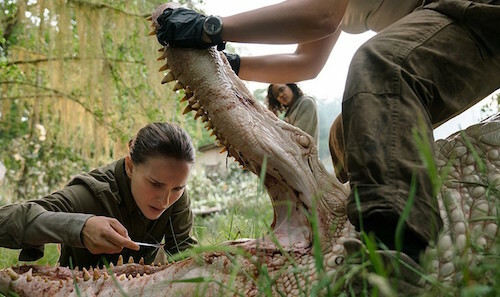 Visually compelling — it’s probably mesmerizing in a Dolby Vision theater — and mentally challenging, Annihilation demands your full attention. While never a love-it or hate-it affair, it’s certainly going to have just as many deterrers as those of us who love it. Garland continues his winning streak and proves that Ex Machina was no fluke. It left me dying to read all three of VanderMeer’s books and hope the trilogy gets completed theatrically.